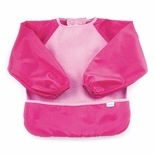 Full coverage bib featuring soft, absorbent fleece front, waterproof polyester backing and sleeves. 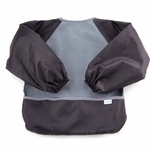 Flip style, catch-all pocket naturally extends outward to ensure all messes are contained! 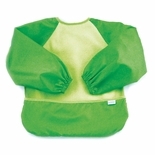 Adjustable snap closure and elasticized cuffs allow the bib to fit 6 to 24 months. Machine washable. Bib measures 12” from neck to bottom of pocket. 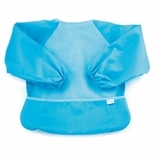 Bib measure 32”W (measured cuff to cuff) x 14”L (shoulder to bottom of pocket).